Steering clear of the political slugfest over the Rafale deal, Hindustan Aeronautics Limited (HAL) Thursday said it was not interested in the French fighter jet project offsets anymore and asserted it was not being ignored by the government. The Defence sector public sector undertaking also said the political fight over Rafale has not affected its morale and business prospects. "Yes, we do feel bad when there are bad things said, but it has not affected us. Our staff and middle management are more enthusiastic. This does not affect our business either," HAL chairman and managing director R Madhavan said. He also said the company was not interested in "offsets and direct purchases". "..That was the government's decision to take it as a direct purchase and we are not interested in it, he added. 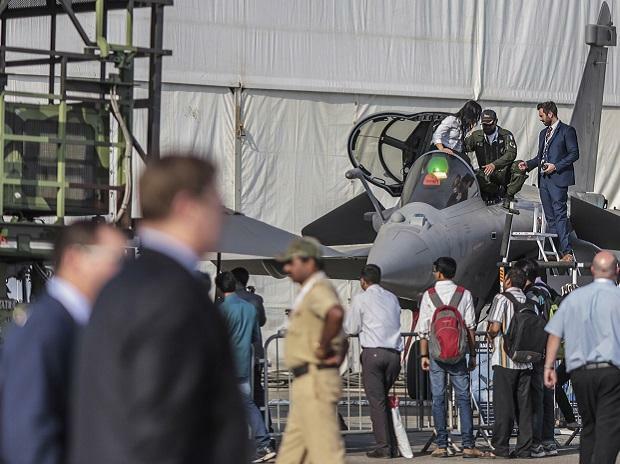 "If it's coming as a business to us, we will be interested in it," Madhavan told reporters at the Aero India 2019 air show at the Yelahanka IAF air base, north of Bengaluru. On the issue of the HAL's man-hours for manufacturing the Rafale, Madhavan said there is always a learning curve and there should not be any comparison of HAL's first aircraft with the 100th aircraft of others. "You cannot compare our first aircraft with somebody's 100th aircraft. There is always a learning curve for the first one. If you look at the Su-30, our man-hours is lesser than the original equipment manufacturer. So you must compare our 50th aircraft with their 50th and so on," he said. "Also, our manpower cost is very low compared to them, and, moreover labour cost is a very small component of the project," he added. India has signed an inter-governmental agreement with France for purchase of 36 off-the-shelf Dassault Rafale twin- engine fighters, dropping the earlier proposal to buy 18 jets with 108 others being assembled in India by HAL. The HAL chief also brushed aside the remarks of Minister of State for External Affairs V K Singh on Mirage 2000 crash, saying the incident was not the way it was reported in the media and he would await completion of court of inquiry. "Our capabilities are on par with anybody else. There is no shortage on these fronts. Anyone can make such comments. There were media reports after the Mirage crash, but we decided not to say anything until the CoI (court of inquiry) is complete," Madhavan said. "The crash was not the way it was reported in the media and people have blamed the HAL without knowing the full facts," Madhavan added. Singh, a retired Army chief, had flayed the HAL after the recent crash of Mirage 2000 in Bengaluru, saying, "Look at the condition of HAL. Our two pilots died. Sorry to say, but the programmes at HAL are running late by three-and-a-half years. "Parts of aircraft are falling off on the runway. Is this capability? On the other hand, we say that HAL is not getting the (Rafale) work," he had said. The crash had killed two pilots -- Squadron Leaders Samir Abrol and Sidhharth Negi -- who were attached to the Aircraft and Systems Testing Establishment (ASTE). The two were on a test flight of the Mirage upgraded by the HAL. Madhavan rejected the contention that HAL was being ignored, as alleged by the Opposition, particularly Congress president Rahul Gandhi, who has been accusing the Modi government of sidelining the PSU and favouring Anil Ambani's firm. Asked if the PSU was being treated badly or ignored, Madhavan said if that was the case the company would not have got a lot of orders. "If we were ignored we wouldn't get orders that we are getting," he said. Replying on the not-so-good financial condition of the HAL, senior HAL officer Shekar Srivatsa said there were no issues on this front with regard to cash flow, which was hit due to the delay in repayments by four of its customers including the Army, Navy and the Air Force. However, things would look up after the announcement of the new budget, he said, adding the company was working on utilising the working capital available. Srivatsa also said the HAL was having a lot of export clients who are happy with it.